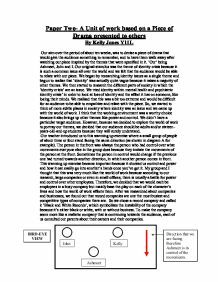 A Unit of work based on a Piece of Drama presented to others. Paper Two- A Unit of work based on a Piece of Drama presented to others By Kelly Jones Y11L Our aim over the period of about ten weeks, was to devise a piece of drama that would give the audience something to remember, and to have them walk away after watching our piece inspired by the themes that were specified in it. 'Our' being Ashmeet, John and I. Our original stimulus was the theme of identity crisis because it is such a common issue all over the world and we felt that the audience would be able to relate with our piece. We began by researching identity issues as a single theme and begun to realise that 'identity' was actually quite vague because it raises a majority of other themes. We then started to research the different parts of society in which the 'identity crisis' are an issue. We tried identity within mental health and psychiatric identity crisis' in order to look at loss of identity and the affect it has on someone, like losing their minds. We realised that this was a bit too extreme and would be difficult for an audience to be able to empathize and relate with the piece. So, we started to think of more subtle places in society where identity was an issue and we came up with the world of work. ...read more. John developed his character using the stimulus we had from doing the 'power and control' warming up exercise because we discovered that when we did it as a group, Ashmeet and I, subconsciously, never turned towards John's direction in order to give him the power and control over us. Therefore he spent the entire exercise doing the movements he was being controlled to do. This conveyed conformity, which helped us develop his character. We decided that John would be an accountant in the company because accountants work consistently and are always given work to do, and are never independent in ideas or anything because all they work with is numbers. We used the idea of numbers as stimuli for John's character. At first I was slightly lost when it came to my character, so Ashmeet and John hot seated me a few times and we still couldn't think of a significant character for me. Finally we tried a random freeze frame with Ashmeet and John's character personality conveyed in it. I noticed the Ashmeet was dominating over John by leaning on him and he was kneeling on the floor, whilst Ashmeet stood to illustrate the power that she had. Ashmeet was staring straightforward with a determine look on her face. I think this showed her strength and control, whilst John looking down at the floor, portrayed his frailty and his lack of confidence. ...read more. The name of Ashmeet's character was Sarah, John's was Winston and mine was Caz. I think that I was effective at conveying Caz in the dance motif because when it was my turn to control the movements, my movements were relaxed, curvy and soft to represent the creative skills she has because she wants to be a song-writing singer. When it was Ashmeet's turn to control the movements, her movements were stiff, straightforward and firm to represent her independence, her power and her strength. This was effective because her movements weren't flexible which perfectly illustrates her decisions. She has things her way and only her way because her decisions are not flexible. When it became Winston's (John's character) turn to control everyone else's movements, Ashmeet and I just turned right around and ignored Winston and continued to control each other. This characterizes his weakness and his lack of power and control over Sarah and Caz. It also shows how he has an inability to stand up for himself. Near the end of this dance-drama after Winston walks off because he gave up, Caz starts to disobey the movements that Sarah to for her to copy to convey Caz being a little stronger than Winston and having a mind of her own. Ashmeet shows Sarah's short and bad temper by storming off leaving Caz isolated in the space. I thought that this opening to our piece was successful in making the audience begin to recognize the status of our characters because they were very distinctive and clear. We used ...read more. we didn't want to clutter up the stage and only used necessary props and costume. To show the audience when the character was changing there would be a clear costume change as we thought this would help the audience notice each change. For my specific character, i needed to develop a very different posture and auora for my character. My character did not have a name as in our piece we wanted to stereotype him into the mean,rich,bully type who has everything his own way and bullies those under him. By doing this we will not have overlapping of work and both the people can concrete on what they are doing the best. Creative writing piece with commentary. Chicago is an unconventional musical because it doesn't slap crime it celebrates it and this intrigues audiences to enjoy it because they always like something new. Dance is an enormous element in this musical because it derives the emotions and themes effectively throughout the entire musical. Drama Notebook - The theme that we were given to work with was justice. be there and as if he felt uncomfortable talking to his ex-wife. We decided to do a performance of dance drama to tell the audience that justice can be interpreted in many ways. We decided not to have any music on and to just repeat over and over again "an eye for an eye, a tooth for a tooth". The sentence was much too long and confusing so I changed it to "When you return to the casualty re-check their breathing. If they are not breathing or if the likely cause of unconsciousness is trauma or drowning then you must now give two rescue breaths". They have a brief conversation about why the girl wasn't at school, and the dad enters the house to be greeted by a pile of sick, to which he comments "Not again." His tone of voice suggested that this wasn't an unusual event.